Welcome to one of Kihei’s most exceptional vacation getaway homes! Step into total luxury and amenities, including your own private pool, perfect for a refreshing morning dip. Open the lanai doors off the living room for instant island breezes and natural light from the Hawaiian sun. Upon your arrival, an electronic coded gate keeps your oasis safe and secure. Continue along the lengthy palm tree-lined driveway to a spacious, covered carport that accommodates four vehicles. Pristine landscaping features three water fountains, cheerful floral beds, tall Eureka palms, and a large grassy lawn and barbecue area. This exquisite island home offers an open floor plan with vaulted ceilings, and a spacious, renovated kitchen equipped with stainless steel appliances, a wine cooler, and bar seating for three. The 8-seat dining table and overlooks the sparkling clear swimming pool. Ceiling fans and bamboo flooring frame the living room that’s decorated with plush furniture and state of the art electronics. 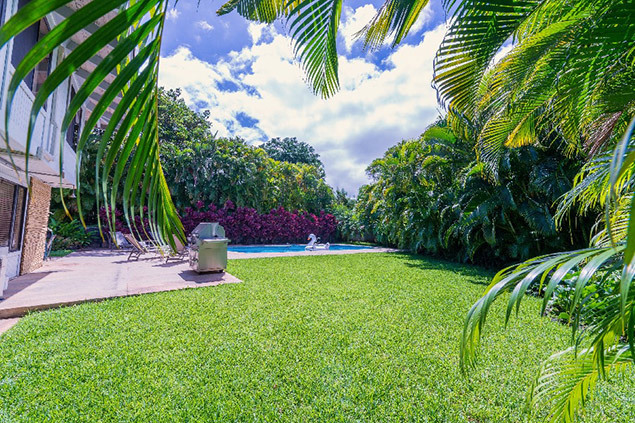 Two entrances adjacent to the living room lead you out to the large, beautifully-tiled lanai. Patio speakers let you listen to your favorite tunes while you take in the stunning ocean and mountain/Haleakala views, beverage in hand. Love mangoes? When they’re in season, you can pick them right off the trees in your yard! The Maui Dolphin House sleeps up to eight across four spacious bedrooms with ample sleeping arrangements, as well as three bathrooms. Each bedroom window opens onto lush greenery. Melt into peaceful bliss as you relax in your own jetted, garden tub, soaking in the soft sun rays through the glass block window. The recreation room downstairs is a blast — fully-equipped with a full-size refrigerator, bar area, futon, and direct access to the patio BBQ, swimming pool and oversized backyard. A full size washer and dryer make laundry a convenience. This extravagant home has everything you need to enjoy a flawless vacation! The Maui Dolphin House is situated in Maui Meadows, a safe and friendly family neighborhood in sunny South Maui. Here you can relax and live true Hawaiian style — open and relaxed with fresh air, while keeping your privacy. Location-wise, you’re minutes from the exclusive resort community of Wailea, which is known for award winning golf courses, championship tennis, spas, exclusive shopping and abundance of restaurants with a wide variety cuisine options. You’re also near South Kihei, a great base for exploring the island and taking advantage of all the activities that Maui offers. Steps away are some of the world’s most beautiful beaches, superb shopping, renowned restaurants, and world-class golf. Maalaea Harbor: many boats leave from Maalaea on snorkeling trips, deep sea fishing, scuba diving, whale watching (in season), sunset cruises, and more. It is much quicker to leave from Maalaea Harbor than Lahaina Harbor when taking trips to Molokini Crater and Turtle Town. Maui Ocean Center, Haleakala, Iao Valley, Maui Tropical Plantation, and the Whale Sanctuary. The town of Kihei: a quaint, laid-back beach town with dreamy white sand beaches and turquoise waters. Kihei boasts local favorites such as Coconuts Fish Cafe to fine dining at Sarento’s, as well as familiar grocery stores such as Safeway, and others stores like Hawaiian Moons Natural Foods. 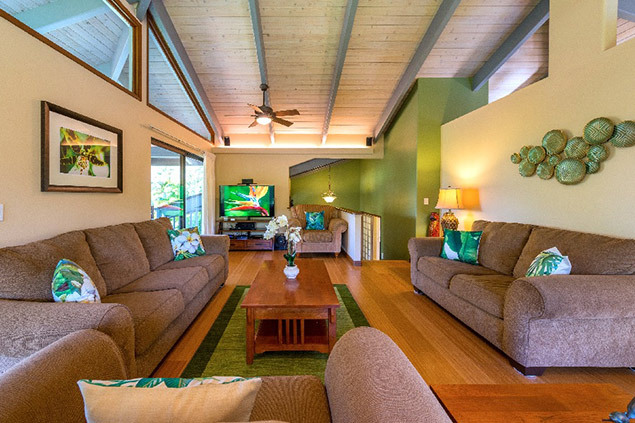 We promise you’ll thoroughly enjoy your tropical home away from home at the Maui Dolphin House! Maui No Ka ’Oi (Maui is the best)! Looking forward to hosting you on your next trip to paradise! Our team is always available to be reached via email or phone. We have Housekeeping on call; additional cleaning could be arranged at a fee, generally our long stay guests take advantage of this service. Our Maintenance crew is on call and can assist at any time. Check-in and Check-out are very simple: we send you a pre-arrival email that has all necessary information on how to get to the house, what the door lock code is, etc. We recommend you print the email prior to the trip or saving it on your smartphone to easily access it when you arrive at the house. A private Concierge is always standing by to help with any activity bookings, island recommendations and restaurant reservations.